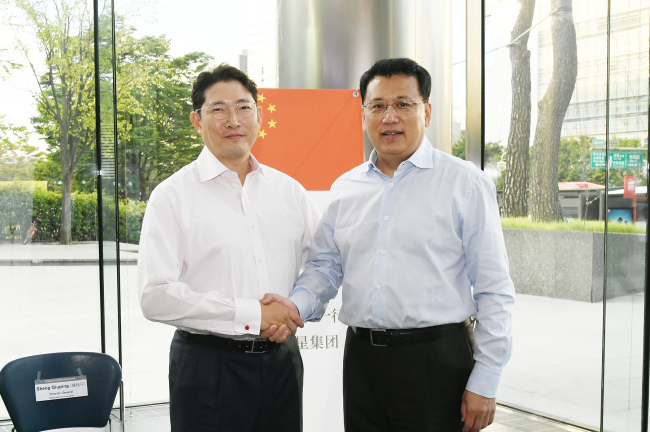 Hyosung Group Chairman Cho Hyun-joon has promised wider business cooperation with Yuan Jiajun, the governmor of Zhejiang province in China, at its headquarters in Seoul on Saturday during Yuan’s four-day visit to Korea, according to the company on Monday. Zhejiang, an eastern coastal province of China, is Hyosung’s first overseas production base. In 1999, the Korean firm set up a spandex factory in Jiaxing, a prefecture-level city in northern Zhejiang province, as part of the firm’s strategy to jump into the global market. Hyosung has since become a leader in the spandex market since 2010, taking up 30 percent of the global market share. Since Hyosung set up a trade office in Beijing in 1988, it has continued to expand its business in China. Currently, the firm has 15 production bases and three trade offices in China. Hyosung has so far invested over $1.5 billion in China in key product businesses, including spandex and tire cords, generating $2.2 billion in sales and hiring over 7,000 people last year.